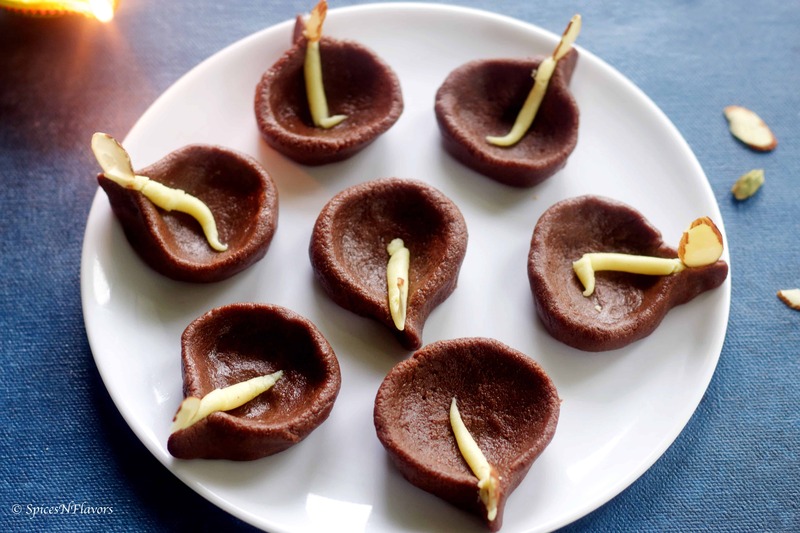 Chocolate Diya Peda is an interesting version of shaping our regular Chocolate Pedas to make it more festive and appealing to the eyes. 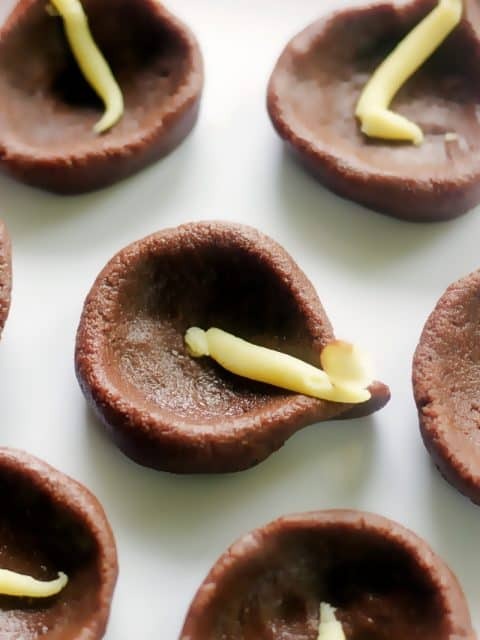 Chocolate Diya Peda basically follows the recipe for making a milk powder peda with the addition of cocoa powder which lends it the chocolaty taste and also the earthy colour of a diya. Wondering what a diya is? A diya, native to India is a mini version of oil lamp usually made from clay that holds the oil or ghee with an immersed cotton wick that can be used to light. The light coming from Diya represents the good over the bad; I wouldn’t want to go into the details here (you can read more on google though) but keeping it short every Indian knows that Diwali is incomplete without diyas. 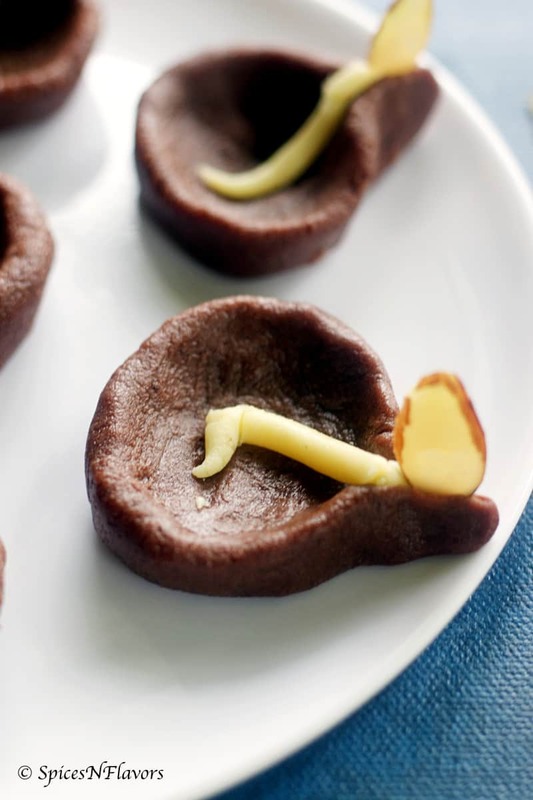 So why not include an edible Chocolate Diya Peda in your Diwali preparations this year? If you have been following me for a while; you know that I have posting loads and loads of Diwali recipes. Clearly its one of my most favourite festival. 6. 10 mins ButterScotch Peda and many more. I have added all this in a Playlist for your easy access. You can check that by clicking here. Or I have also created an entire Pinterest board for Diwali recipes from all around the web. You can follow that board too if you wish. I will link it here – Diwali recipes. 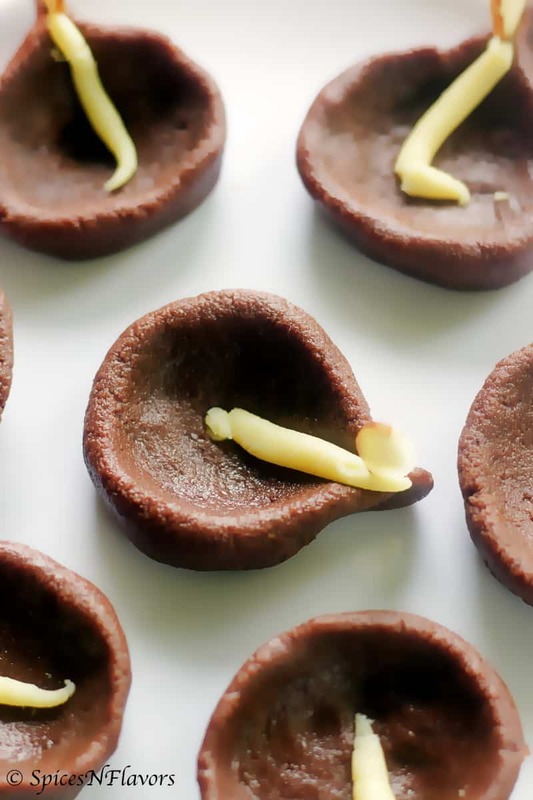 The best part of this Chocolate Diya Peda is that it just takes 4 mins to make them. In admist of all the Diwali cleaning and shopping and working it would be difficult for some of us to make a whole lot of goodies at home. But this recipe is so simple that anyone can make it in 10-15 mins. 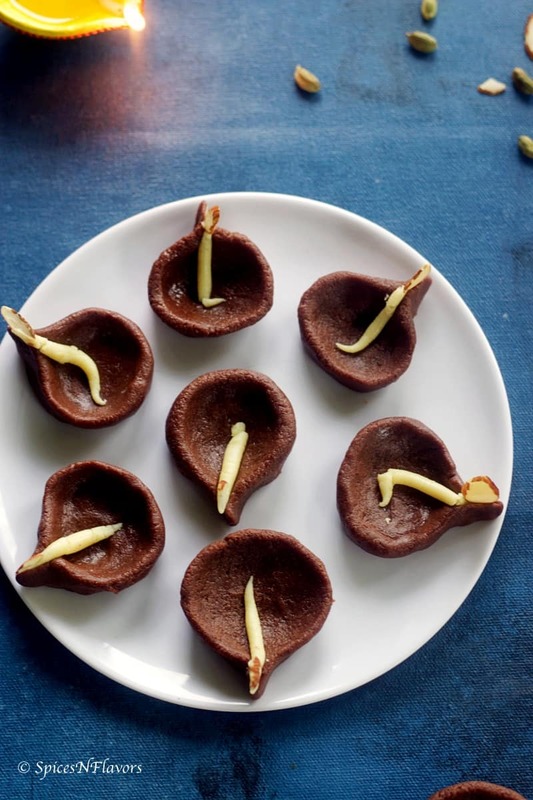 Now ofcourse you don’t have to make a Chocolate Diya Peda; I mean you can simply use the recipe and make a regular peda out of it if you are pressing on time. However Chocolate Diya Peda makes it look even more festive. Hope you like this recipe. If you do then remember to tag me, tweet me or instagram me. I would love to follow you and your posts. In a microwave safe bowl, combine together ghee, condensed milk, milk powder and cardamom powder. Mix everything together. Out of the above mixture remove 2-3 tbsp of the mixture and keep separately. We will use these to make wicks for our diyas. To the rest of the mixture add 2 tbsp of cocoa powder and mix well. Now microwave this for a minute. Remove from microwave give a stir and again microwave for a minute. Repeat this two more times. So basically microwave for a total of 4 mins; stirring in between every minute. Let this mixture cool for 30 minutes. Meanwhile microwave the one that you have kept aside for making wicks. After 30 minutes divide the chocolate mix into small portioned balls. Out of each ball, make a diya or shape them into diya as shown in the video. Make wicks and place it on the diyas. Take sliced almonds and place it to resemble fire. 1. If you do not have time to shape them into diyas you can make it into regular flat pedas. 2. Do not microwave too much; check after every minute. The first time I tried this recipe I microwaved it to 7 minutes; it was overcooked, became super dry and had to throw away the entire lot. So do stir after every minute and do not microwave for more than 4 mins. 3. You can also do the ball test about which I had mentioned in my Milk Powder Burfi post. 4. Do remember to take out some mix for making wicks. 5. You may have to let it air dry for atleast an hour before consuming it. 6. Alternatively you can make this on gas stove too. For the procedure please check my Milk Powder Burfi recipe. I hope you are enjoying my Diwali special recipes. I still have one more recipe coming up on the blog. One no wait two… I really don’t how many.. hehe.. So stay tuned with us for all the yummy recipes. Can we make this chocolate dia on gas stove. Unfortunately my micro oven has gone to repair and Im not sure of getting that anytime sooner. But I want to try this very recipe badly. It is so tempting. 😊 Pls let me know if it’s possible to cook this on gas stove. Hi.. Loved the recipe.. Want to try.. Will not be able to use microwave now. Can you please help on how to go about it using gas stove. Thank you so much dear.. Glad you liked it..
Hi Arpita.. So good to know that you liked this..
Can’t wait to learn how it turned out for you.. Please do share your feedback with us.. Thank you.. I tried making this but in less than 3 minutes of microwaving it started rolling n getting accumulated. And also my milk powder is very grainy in texture. It’s not fine as yours . Which milk powder have u used? Hi Kanika.. The timing also depends upon the microwave.. yours might be a high power one.. It takes anywhere from 3 to 4 mins. Just microwave for 3 mins, let it cool and start making diyas you will get it right.. So creative and festive, edible diyas and so easy to make. I’m definitely going to try this one. Only one question, can this be made couple days in advance and store in fridge? Hi Pinky.. wow so much looking forward to it.. hope you enjoy making and relishing the diyas.. Very tempting.. can u tell me which milk powder have u used? I have used full-fat milk powder for this recipe..
Can store this in the refrigerator too just bring it to room temperature before serving.. but there are possibilities it would stick to your hands just like how a regular peda does.. so 3-4 days at room temperature is perfect.